The case of the mysterious murder of Seth Rich is heating up. Kim Dot.com is allegedly appearing on Sean Hannity’s show tomorrow night after Sean invited him on Twitter, where he claims he will provide proof that Rich leaked over 44K emails and over 17K attachments to Wikileaks. Last week, Private Investigator Rod Wheeler appeared on Fox5 news in DC with an update in the unsolved murder of DNC IT expert Seth Rich, claiming proof exists on Rich’s laptop proving he was Julian Assange’s source for leaked DNC emails during the 2016 election – an account in direct conflict to the Russian hacking narrative based on a discredited IT firm’s report. Wheeler walked back his statements the next day, however the fuse was already lit… Weaponized autists on Reddit and 4chan began furiously digging back into the Seth Rich case for clues in the still unsolved murder – and they went deep. Among the findings were Seth Rich’s Reddit account, email addresses, and Twitter accounts – one of which was in support of candidate Bernie Sanders. As an aside – before joining the DNC, Rich moved to Washington DC to take a job with polling and research firm Greenberg Quinlan Rosner – whose founder Stanley Greenberg was a senior advisor to President Bill Clinton. As Seth Rich posts reached a crescendo Friday night – dominating the front page of /r/The_Donald, the Conde Nast-linked website shut the ‘subreddit’ down for around 12 hours following a moderator’s unrelated declaration of war on the rest of Reddit over censorship – completely killing the Seth Rich momentum. 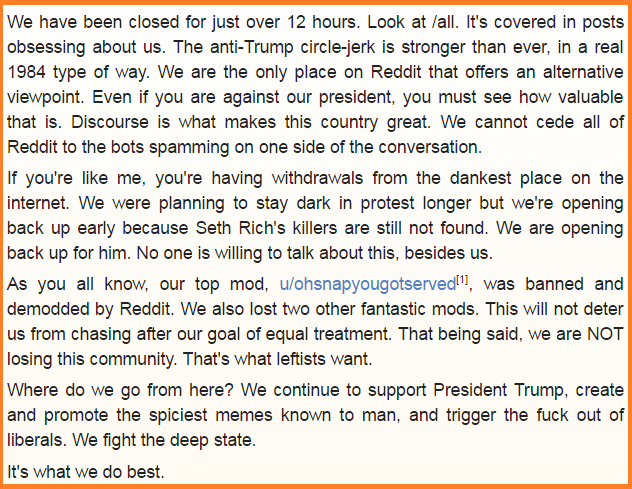 When The_Donald was reopened, ‘officially’ to aid the Seth Rich effort – the offending moderator had been banned and two other mods were removed from their positions. Seth Rich posts, however, are notably sparse. Oh, and Reddit edited Seth Rich’s account during the lockout. Kim Dotcom is pissed – and has been plotting revenge against Hillary Clinton, Obama, and Hollywood after being targeted in the biggest copyright infringement case in history – which included a massive illegal (and then legal) raid on his New Zealand mansion by 76 armed officers and two helicopters. The Mega founder has stepped forward to offer proof that Seth Rich was one of Wikileaks’ sources during the 2016 presidential election. Why were no employees of Joe’s City Bar where Rich was last seen questioned about his final hours leading up to his murder? Why was the surveillance tape in the bar not seen by investigators? WND – A manager of the Washington, D.C., bar where Democratic National Committee worker Seth Rich was last spotted hours before he was shot and killed last summer told WND that D.C. police officers never interviewed the bar’s staff or requested any evidence from the bar, including the bar’s surveillance video from that night, as part of an investigation into Rich’s murder. The revelation backs up a claim made by a private investigator who worked on the case who said D.C. police were told to “stand down” on the investigation. WND also can report that the investigator recently was ordered to “cease and desist” his work on the murder case. His name is being withheld for this story. He said the bar’s surveillance video runs in a cycle of 30 days and that, by now, any footage that may have existed of Rich the last night he was seen alive has been taped over. Furthermore, the manager said police never asked for any other kind of evidence from the bar such as Rich’s bar receipt from that night. The manager did note he wasn’t sure if Rich paid using a credit card or cash. Seth Rich’s girlfriend, best friend and parents all speak out about the brutal murder that DC detectives are calling a “botched robbery” that left Rich dead while leaving all of his valuables, including his wallet on his person. Seth Rich’s parents admitted that after Seth was shot, police reported that he was “quite talkative”. If Seth was “quite talkative,” then why aren’t there any leads on his killers? Seth’s parents appear to be Hillary sycophants. They appear to be very proud of their son as they tell Crime Watch Daily that he was just getting ready to go to work for Hillary’s campaign. They also adamantly stand behind the Democrat Party and claim they are angered by any claim that a hit was ordered on Rich by online citizen journalists. As more and more evidence is being revealed about Rich’s possible role as the leaker of the DNC emails to Wikileaks, the attitude of Seth’s parents towards citizen journalists has taken a surprising turn. In this video that was just released, Rich’s parents appear to be praising the work of citizen journalists that are forcing the investigation into Seth Rich’s death via social media. According to research conducted by a 4Chan citizen journalists, Joseph Capone, the owner of Lou’s City Bar where Rich was last seen alive, visited the East Wing of the White House 4 days before the murder of Seth Rich. Crime Watch Daily investigated the murder of Seth Rich and compiled an interesting video that includes interviews with Seth’s girlfriend, best friend and parents. Although there are pockets of darkness, for the most part this neighborhood is pretty well-lit. Investigators tell Crime Watch Daily in the early morning hours of July 10, Seth was walking home. He was only about a block and a half away from home when he was gunned down, shot in the back. “The officers who were there and they said ‘Yeah, he was quite talkative, he did not realize he had been shot,'” said Joel Rich, Seth’s father. But an hour and a half later at a nearby hospital, Seth was pronounced dead. Heartbreaking news to Kelsey Mulka. She was just on the phone with him, and in a split-second he was gone. Now Mulka is breaking news in our exclusive interview, revealing details, telling Crime Watch Daily there was no sign of trouble in his voice that terrible morning.